One of the great debates of the Radio Era was “Live” versus “Transcribed” broadcast. This seems like a curiosity today in the Cable TV era, when about the only live shows are sports and local news, and even those are subject to a short delay to keep anything from “slipping” On the Air. Transcription, the practice of recording a program for later broadcast, has some pretty obvious advantages, but the policy of the big networks for most of the Radio Era was to broadcast live. Some famous proponents of transcription were Freeman Gosden and Charles Cornell of Amos ‘n’ Andy fame. They realized that there were unrealized profits to be had by recording their live broadcasts and allowing local broadcasters to use the material at a later time. On of the most prolific transcribers was C.P. “Chip” MacGregor. MacGregor first appears in the records as the West coast distributor of Brunswick Records. The Brunswick Company is better known today as a manufacturer of billiard tables and bowling alley equipment, but in the early decades of the twentieth century they dabbled in phonograph equipment before being selling the division to Columbia. In 1924 MacGregor operated from a store San Francisco, and opened a recording studio nearby, presumably to produce material to play on the phonographs. 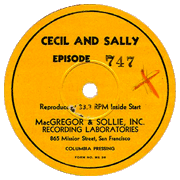 One of MacGregor’s first transcription efforts was the popular Cecil and Sally show. Starring Helen Troy and Johnny Patrick, Cecil and Sally was initially based on the banter between the switchboard operator and the staff organist at San Francisco’s KYA. KYA was part of Adolph Linden’s early ABC network which folded in August 1929 under a cloud of scandal. 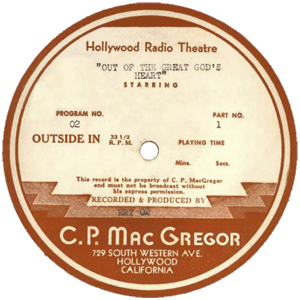 Forced off the air from August until December of ’29, when they opened on KPO San Francisco, Troy and Patrick made the decision to build their fan-base using electrical transcriptions recorded at the MacGregor Studios. MacGregor transcription discs were made under a few different business partnerships, beginning with MacGregor & Ingram Co, and MacGregor and Sollie in 1932. In 1945 the C.P. MacGregor Studios began operating from Hollywood. There was a common complaint that transcribed programs lacked the excitement of live broadcasts. MacGregor was quick to point out that he was willing to forgo the “excitement” to create flawless shows. Performing in a recording studio was certainly more pleasant and less stressful for the On Air talent. It would have been much simpler for the broadcasting technician to start and stop a phonograph on cue than to deal with actors in the broadcast studio. Contrary to popular belief, until the advent of magnetic recording tape after WWII, there was very little editing of transcribed programs. The recording was made by cutting a groove in the recording media, so the entire program had to be recorded in a single cut. 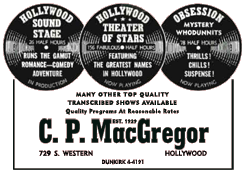 MacGregor Transcriptions include Lux Radio Theater, Skippy Hollywood Theater, Obsession, Proudly We Hail, Heartbeat Theater, and Jonathan Thomas and His Christmas on the Moon. This entry was posted in Old Time Radio and tagged Cecil and Sally, MacGregor Transcription Disks. Bookmark the permalink. C.P. MacGregor was operating in Hollywood in 1942 and most likely before that at 729 S. Western Ave., L.A.
Mac Gregor 10 inch transcription CPM-10-339. EYE WITNESS VON HINDENBERG CRASH . What year was it transcribed on this disc? Sat in on the Irish Rovers “Unicorn” Sessions, Phil Yeend engineer. Must have been in 1968-69. We also acquired the Universal radio advertising account from Chip. It was great just to see some of the old live radio show rooms which were still left just as they were during broadcasts.